A commercial diver may have discovered a lost decommissioned US nuclear bomb off the coast of Canada. Sean Smyrichinsky was diving for sea cucumbers near British Columbia when he discovered a large metal device that looked a bit like a flying saucer. The Canadian Department of National Defence (DND) believes it could be a "lost nuke" from a US B-36 bomber that crashed in the area in 1950. The government does not believe the bomb contains active nuclear material. It is sending naval ships out to the site, near the Haida Gwaii archipelago, to verify the find. Mr Smyrichinsky says he came upon the device while diving off the coast of Pitt Island near Haida Gwaii in early October, which is near the Alaskan border with British Columbia. It was "bigger than a king-size bed", perfectly flat on top with a rounded bottom and had a hole in the centre just "like a bagel," he told the BBC. "I found something really weird, I think it's a UFO," he joked with his fellow divers once he came to shore. The area is remote, and Mr Smyrichinsky says he had to wait a few days before he could go into town and find somebody who might know what it is. One of his friends, an "old-timer" from the area, had an idea: "Maybe you found that nuke they lost here in the 50s!" It may sound like something from a thriller movie but accidents did mean that nuclear weapons sometimes were lost in the Cold War and it has often taken years for the full story to emerge. I visited North Greenland a few years ago to look into a 1968 crash in which a US bomber approaching the Thule military base crashed. Parts of a nuclear weapon sank beneath the ice. Special submarines found some of the parts but not everything could be recovered. Two years before that another B-52 bomber crashed in Palomares in Spain. In that case three weapons were found on the ground but a fourth was only located after more than two months of searching the sea. The level of secrecy around nuclear weapons during the Cold War meant that often the full details of what had happened were classified - partly to avoid giving away secrets of weapons design but also because of fears of how local people might respond. 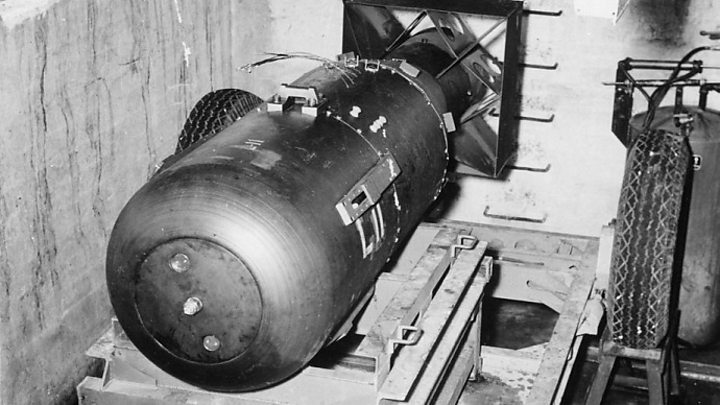 The story of the lost nuke has mystified military historians for more than half a century. In 1950, American B-36 Bomber 075 crashed near British Columbia on its way to Carswell Air Force Base in Texas. The plane was on a secret mission to simulate a nuclear strike and had a real Mark IV nuclear bomb on board to see if it could carry the payload required. Several hours into its flight, its engines caught fire and the crew had to parachute to safety. Out of a 17-person crew, five didn't make it. The American military says the bomb was filled with lead, uranium and TNT but no plutonium, so it wasn't capable of a nuclear explosion. The crew put the plane on autopilot and set it to crash in the middle of the ocean, but three years later, its wreckage was found hundreds of kilometres inland. Dirk Septer, an aviation historian from British Columbia, says the US government searched the wreckage but couldn't find the weapon. "It was a mystery to everyone," he told the BBC. "It was the height of the Cold War and they were just paranoid that the Russians would get a hold of it." Crew members have said they dumped the bomb in the ocean first, fearing what the payload of TNT could do on its own if it were detonated. A spokesperson for DND told the BBC the department had conferred with its American counterparts, and that the object the diver found could very well be the bomb. The American military do not believe the bomb is active or a threat to anyone, he said, but Canada is sending military ships to the site to make sure. But while the military and the diver believe they may have found the lost nuke of Bomber 075, Mr Septer says the diver's location is totally wrong, given what we know about the plane crash. "It could be anything," Mr Septer said. "Whatever he found, it's not the nuke."